Rest. Sometimes a moment of silence is all it takes to put someone on notice that the comment he or she just made was not welcome or appropriate. Examine the options. If the person made one minor comment, you may be able to ignore it and move on. But you don’t have to tolerate abusive situations. You can stand up for yourself without offending the customer, and in severe cases you can call on your supervisor or a colleague for assistance. Cue the customer that you are listening. Wait for the customer to agree to change the behavior before you continue. Usher the conversation forward. Turn the conversation immediately back to the customer service issue. Earn respect with your demeanor. When dealing with this type of situation, mirror the customer’s intensity with your remarks. If the customer is speaking in an intense manner, don’t be meek in asking for a change. Be calm and firm, not confrontational. 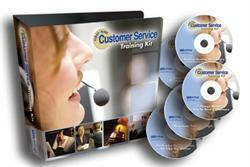 Purchase the First-Rate Customer Service Training Kit to learn how to apply the RESCUE method when dealing with these difficult types: Impatient Customers, Demanding Customers, Hostile Customers and Offensive Customers. Never has it been more important to get back to providing good old-fashioned customer service. That’s why you need the First-Rate Customer Service Training Kit. This comprehensive multimedia product will develop customer service reps’ skills in a wide range of areas, including communicating, dealing with difficult customers and turning service into sales. The program serves both as a training program that supervisors can facilitate for teams and as a self-paced study course that service reps can take on their own. This entry was posted in First-Rate Customer Service Forum and tagged Customer service, Difficult Conversations, RESCUE process, self-improvement, training. Bookmark the permalink.